Thomas Mifflin, the eldest son of wealthy Quaker merchant John Mifflin and his wife Elizabeth Bagnall, was one of those men of the Revolutionary and Federalist periods who seem to have been everywhere and done everything. After attending the Academy and College of Philadelphia and earning his A.B. in 1760, he learned the merchant trade in the business of William Coleman. After returning in 1765 from a tour of Europe, he entered into business with his brother George, married his cousin Sarah Morris, became a member of the American Philosophical Society and began to take an interest in public life. Very early on in the struggle between the colonies and the crown, Mifflin became an outspoken, moderate Whig who championed colonial rights but not democratic reform. As early as 1769 he served on nonimportation committees. Elected in 1772 to the Pennsylvania Provincial Assembly, he was a delegate to both sessions of the Continental Congress. When war broke out in 1775, Mifflin (in spite of being a Quaker) became a major of a volunteer company. He then traveled to New York to become an aide-de-camp to Washington, rising to the rank of brigadier-general in 1776. 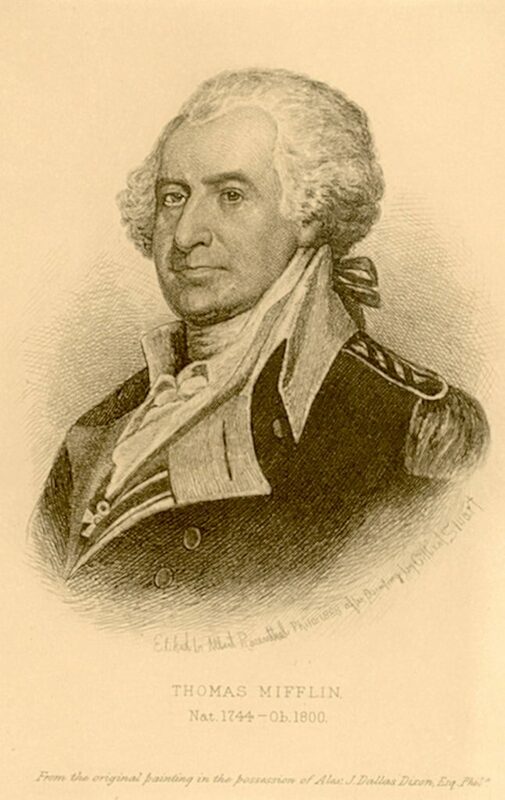 Washington appointed Mifflin as quartermaster-general in 1775; in this position Mifflin traveled through Pennsylvania using his oratorical skills in recruiting troops at a most critical juncture in the war. He resigned the post in 1778 amidst the “Conway Cabal” controversy; Mifflin admitted that he believed that a few officers had too much influence with Washington but steadfastly denied he had ever had any part in any effort to replace Washington as commanding officer, the purpose of the alleged conspiracy. During the war Mifflin continued to promote manufacturing and made investments in privateering, but more and more he became a career politician. At the national level, in 1780 he was also one of three commissioners to recommend the reorganization of military staff departments. In 1782 Mifflin returned to the Continental Congress, becoming its president the following year. In 1787 he was a member of the Constitutional Convention and a signer of the Constitution. At the state level, in 1778 and 1780 Mifflin was a Pennsylvania state assemblyman opposing the radically democratic state constitution based on unicameral legislature. Despite these reservations, Mifflin became speaker of the Pennsylvania General Assembly (1785-1788) and then was elected president of Pennsylvania’s Supreme Executive Council (the equivalent of governor, serving 1788-1790). As governor, Mifflin suppressed the Whiskey Rebellion near Pittsburgh. Under the new state constitution creating a bicameral legislature with a strong governor, Mifflin ran for governor in 1790. Despite the fact that his own party, the Republicans, sponsored another candidate, Mifflin was elected by a margin of almost ten-to-one. After three terms as governor, Mifflin was in 1799 again elected to the state legislature, where he served until his death in 1800, ever the public servant. From 1773 until 1791 Mifflin served as a trustee of the College and Academy of Philadelphia, including a stint from 1773 to 1775 as treasurer of that board. As the speaker of the General Assembly and then as president of Pennsylvania’s Supreme Executive Council, Mifflin also served as an ex officio member of the University of the State of Pennsylvania’s Board of Trustees from 1785 to 1790. After the 1791 union of the College and the University of the State of Pennsylvania to form the University of Pennsylvania, Mifflin no longer served as a trustee.